Shop Steinberg UR22MKII Audio Interface Recording Pack from AMS with 0% Interest Payment Plans and Free Shipping. Get ready for the perfect introduction to music recording and mixing, featuring a full production toolkit with first-class components to get you started right away! 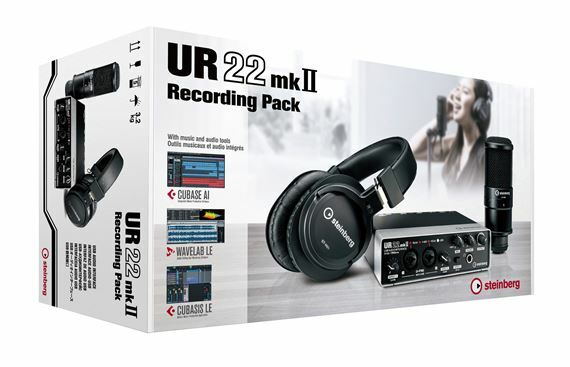 The UR22mkII Recording Pack has everything you need to record and produce your first songs on your computer or iPad: the popular UR22mkII twin-channel USB audio interface, the studio-quality ST-M01 condenser microphone and the durable ST-H01 monitor headphones – including all necessary cables! Also included is a complete suite of music software for Mac, PC and iPad centered on Cubase AI, the streamlined version of Steinberg’s legendary music production studio – all integrated with your audio interface for easy startup and installation!